Andhra Pradesh has been recording on and off rains for the last few days. With the Southwest Monsoon making onset over the state on Wednesday, last 24 hours saw tremendous increase in rains. 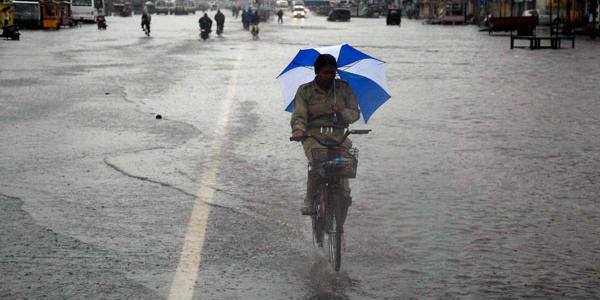 In the last 24 hours from 8:30 am on Wednesday, Machilipatnam recorded heavy rain to the tune of 105.6 mm, Kurnool 62.7 mm and Vijayawada 42.2 mm. In the same time span, Kakinada, Kalingapatnam, Vijayawada and Visakhapatnam too recorded heavy rains. As per Skymet Weather, conditions are favourable for the further advancement of Southwest Monsoon over many parts of Andhra Pradesh in the next 24 to 48 hours. The rain is now likely to increase over the interior districts as the cyclonic circulation which is over Andhra coast will gradually move over the interior districts. Moreover, a trough is also extending from this cyclonic circulation to Konkan & Goa. Thus, the intensity of rains is further expected to increase along the trough line also. Meanwhile, rains over the coastal districts would decrease, although on and off rains will continue to occur along with partly to cloudy sky conditions. In wake of the hefty showers, the temperatures have dropped by 2°C to 3°C and we do not expect immediate increase in temperatures.